Unfortunately, I got nowhere close to my financial goals in 2014. I set some pretty lofty goals and I had no idea what to expect for my first year of budgeting and tracking my spending. Fortunately, we all get to wipe our slates clean for the New Year and I’m bound and determined to make 2015 more successful than 2014 was. Here are three ways I’m getting financially serious about improving my position in 2015. As I mentioned, I started budgeting and tracking my spending just before the beginning of 2014. Since then I’ve faithfully put together a new budget for each month of the year and tracked most of my spending relative to the categories I set up. One thing I didn’t do very well with was tracking how I used my “extra” income from my part-time job, online side hustles, etc. For 2015, my budget will most likely look a little more complex, but in reality it will be a lot easier for me to track how I spend ALL of my income, not just the money I get from my full-time job. By tracking how I use the money from all my income sources, I’ll be able to find my budget leaks more effectively and plug them. I’ve always been a fan of having goals, but I’ve always looked at them as being static. Instead of having goals set in stone, I want to use my tracking system to re-evaluate my goals throughout the year. I think it will be more motivating to know that I can adjust my goals up or down as needed to make me more successful. This doesn’t mean I will be slacking off and lowering my goals all the time. Instead, I’m hoping to set realistic goals at the beginning and shoot for the stars with my efforts. If this works properly, hopefully I’ll actually have to increase my goals throughout the year. At the end of 2013 I took all the plastic out of my wallet except for my debit card and a single credit card “just in case”. Since then, I’ve been irresponsible with my one credit card, using it when it wasn’t really necessary just because I had it readily available. In 2015 I will no longer be carrying my credit card at all. If I ever feel the need to carry it (on a trip or something) I will seek guidance from my readers and supporters first. I think by only carrying cash and my debit card I will be less tempted by things I don’t truly need or haven’t budgeted for. I’m going to make 2015 my most financially successful year so far by following these three self-imposed guidelines. I can’t wait to report back to you at the end of the year about how they turned out for me! What are you doing to get serious about your finances in 2015? How often do you re-assess your goals? Do you carry solely cash, a credit card or both? Tracking as well! Hopefully, there won’t be lazy periods from me regarding this area! I tracked pretty well in 2014, but I know I can do better. Good luck with your goals Kayla! My goal is to work from home. The plan is to make $3,000/month by 2016. I hope to get at least a few months above this in. 2015. That sound like a great goal! Good luck and I can’t wait to hear how it’s going for you throughout the year. Good luck with those goals. Tracking our spending has been one of the key things that helps us prepare for how to budget in the future. I tracked expenses for about 3 months before I made my first budget in January 2014. This helped me to be realistic with what I could cut my spending down to and still be able to stick to my budget (for the most part). I hear you on the meeting of goals. We didn’t make all of ours due to an unexpected trip out of state for a family medical emergency. That seriously left a dent in our wallet. I have made our list of goals for 2015 and am aiming for a better success rate than 2014. 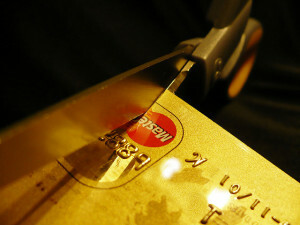 As far as credit cards go, we stopped 5 years ago and don’t have one. I would weaken and use it. Debit card and that is it. Just works better for us. PS When we were out of state we only had our debit card and didn’t have any issues with over-spending. It is possible.